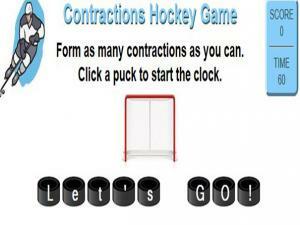 This is a quick game to help you practice recognizing basic contractions. Read the words on the treasure chest. Click on the key that shows the contraction for the two words on the chest. There are 10 questions in total. This is a fun, educational song. Listen and watch as the monster "Apostrophe" eats the letters in the words and they are replaced by an apostrophe. 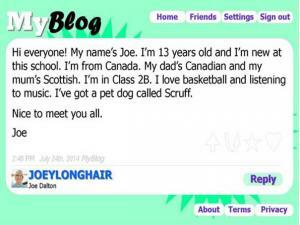 Do you use any social networking sites or keep a blog? Look at the blog post and do the exercises to practice and improve your writing skills. 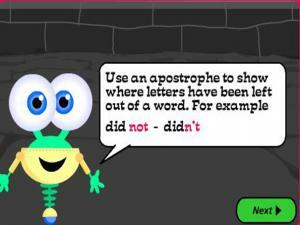 A fun cartoon from the BBC that explains how to use apostrophes then lets you practise by taking the spelling challenge. If you are not sure of the answer, use the Dictionary to help. If you go wrong, there is a full explanation and help for you to go back and get the answer right. This game looks easy at first. 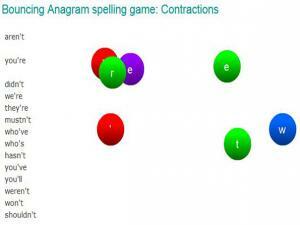 Just drag and drop the letters to complete the contractions game. However, there are different stages and each one gets harder! Do you know your contractions well enough to complete all 10 levels? Good luck! In this game, you have to make your scorpion eat the bugs in the maze that represent correct answers. Each bug is color coded with answer options at the top of the screen. 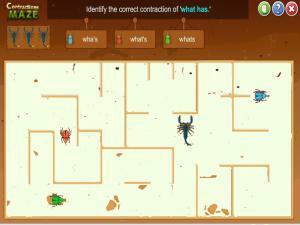 Use the arrow keys to move your scorpion in the maze and answer as many questions you can. 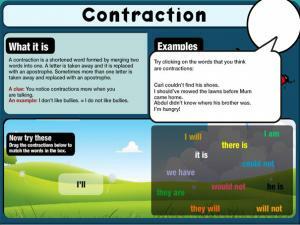 This is a BBC Learning activity about contractions. Read the notes and listen to the podcast to hear contractions used in everyday speech. You can also follow the transcript and see how contractions are formed using an apostrophe. This game is fast! Read the contraction you have to spell, then get your bucket and collect the raindrop letters in the right order to spell the contraction out. How many points can you score? Are you putting the apostrophe in the right place? Test yourself now! 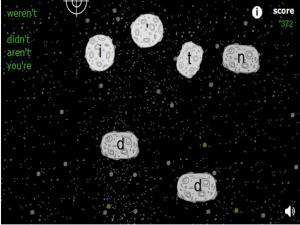 Spell the words in the left column by destroying the asteroids. Watch out for the asteroids with letters that do not spell the words. 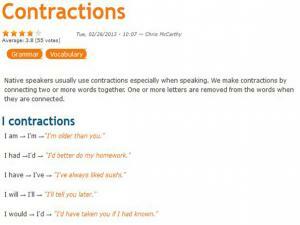 Native speakers usually use contractions especially when speaking. We make contractions by connecting two or more words together. 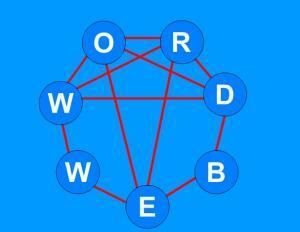 One or more letters are removed from the words when they are connected. 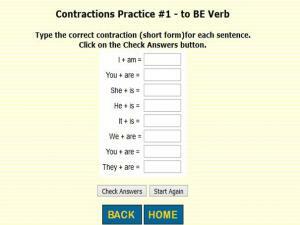 Learn the most common contractions, then test your understanding by completing the exercise. 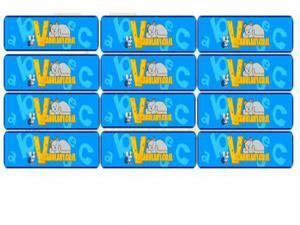 Click on a card and try and match the words to their contractions. Use your memory to complete the game as quickly as possible. The board has word cards and contraction cards. Match the words with their contractions and clear the board. 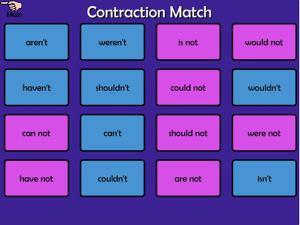 Match the words with their contractions by clicking on the cards and remembering where the match is on the board. 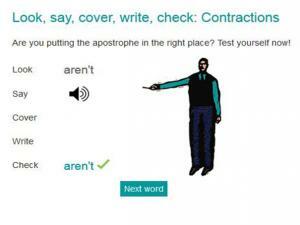 This exercise asks you to pick the correct contraction. Look at the 2 words in the top box and decide which is the correct contraction below. How good is your memory? How well do you know contractions? 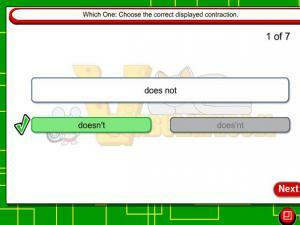 Click the cards, and match the contraction to the correct words. 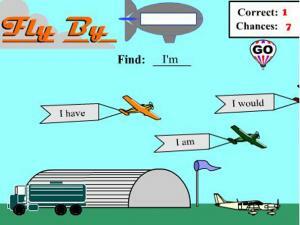 Can you spot the airplane with the correct form for the contraction? This is a fun game to test how well you know apostrophes of contraction. In most games, you have to add the apostrophe. 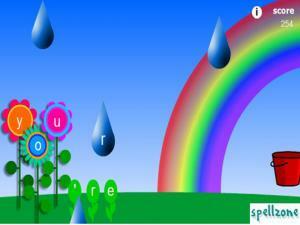 In this game, it is the other way round and you must find the right words that form the contraction given. A game of knowledge and memory for contractions. Take it in turns to find the matching pairs of words and the contracted form using an apostrophe. Click on the cards and get 10 points for every correct pair. If you don't make a pair you lose 2 points and it is the other players go. Good luck! In this game you need to try and form as many contractions as you can in the time. Click to contract the 2 words, then choose the letter that you want to replace with an apostrophe. 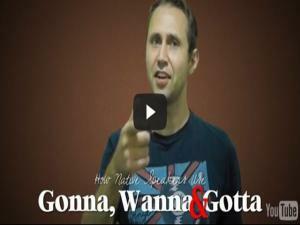 This is a fun site, with lots of videos, to help you learn 3 colloquial contractions “wanna, gotta, and gonna.” These are three of the most common English colloquial contractions. Schools rarely teach these, but they are very important for fluent English communication, and are used A LOT! 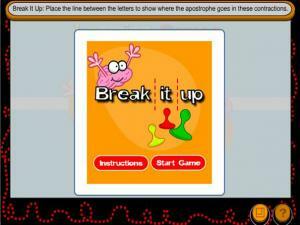 Practise using apostrophes of contraction with this fun game against the clock. You will be given a phrase and you have to write it as a contraction as quickly as you can. You can choose your speed to test yourself. Type your answer in the white box and click enter to submit your answer. At the end, you are shown each answer and any errors are corrected. Type the contraction for the 2 words you see to score a point. 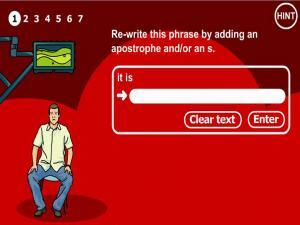 This game tests your knowledge of basic contractions, your use of apostrophes and general spelling skills. To make it a little it harder, you also have to beat the clock! 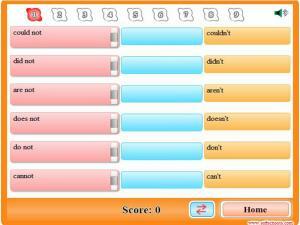 Complete the sentence by typing in the correct contraction into the blank box. Are you putting the apostrophe in the right place? Test yourself with this interactive site by simply following the title instructions! Look at the contraction, listen to the audio, cover and write the contraction out, then check your answer. 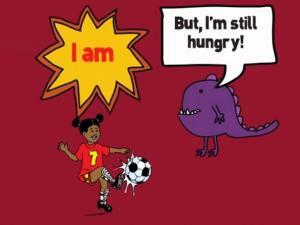 It is great to be able to use contractions when you speak, but they are also useful in writing as well. Do you know how to spell them with the proper punctuation? Place the line in between the letters to show where the apostrophe goes to spell the contraction correctly. Do you know what a contraction is? Which punctuation mark do you use to make a contraction? This site will help you learn how to join two words together to form a contraction and to recognize the words that make a contraction. This site lists all the negative contractions for the verb 'to be'. There is also a song to play at the end to really check your understanding and test your new language skills. A game of mouse skills as well as spelling! 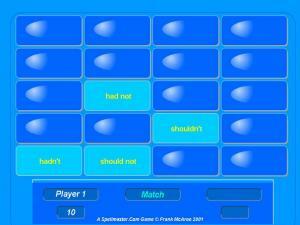 Click on the bouncing balls in the correct order to spell out one of the contractions listed on the left hand side of the screen. Even if you know the correct spelling, make sure you click on the right ball before it bounces otherwise you will lose points! In spoken English we use the short form a lot. Instead of "I am" we say, "I'm". "You are" becomes "you're". "Did not" - "didn't" etc. 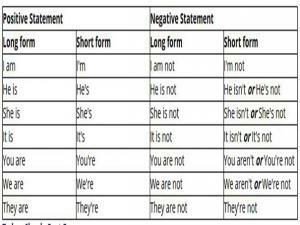 We also use these short forms in informal written English. 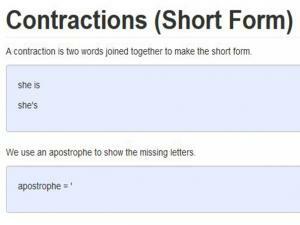 When we write the short form, we use an apostrophe (') for the missing letter(s). This site gives you a good, quick reference for the short forms of the auxiliary verbs 'to be', 'to do' and 'to have'. 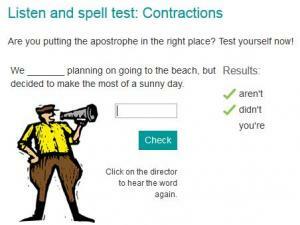 Take this quick quiz to test your knowledge of contractions. 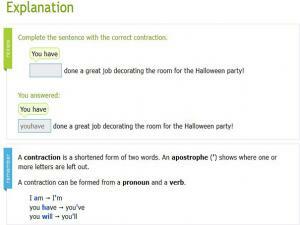 Type the correct contraction (short form) for each phrase of sentence. Click on the Check Answers button. There are three common types of contractions: subject + auxiliary verb; negative sentences with 'not'; and question words with 'is'. 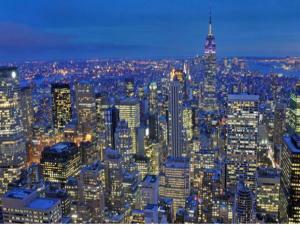 This site goes through all three types, with lots of examples and tables for quick reference. This game tests your knowledge of contractions, as well as your listening, reading and spelling skills! Listen to the audio and read the sentence to make sure you know which contraction you are being asked to spell. Type in your answer and see how many you can get right in the time. Are you putting the apostrophe in the right place? Test yourself with this spelling game. Read the sentence and type the contraction in the box to complete it. Check to see if you have the right word AND the apostrophe in the correct place.